These are the technology elements of "automated demand response." Thanks to research conducted at the Department of Energy's Lawrence Berkeley National Laboratory, with support from the California Public Utilities Commission, the use of automated demand response ("AutoDR," for short) has been expanding in California. "AutoDR has the potential to substantially reduce California's electrical power demand, especially during periods of high demand such as summer afternoons," says Mary Anne Piette of Berkeley Lab's Environmental Energy Technologies Division (EETD). Piette is Research Director of the Demand Response Research Center (DRRC); she estimates that potential cost savings from the use of AutoDR could range as high as a billion dollars. Demand response, DR, is the process of managing energy use dynamically through cooperation between power customers, their electric utility, and the electric system's operator (the independent system operator, or ISO). When the electrical grid is near capacity for any reason — for example, when too many air conditioners start laboring on a hot summer's day — the ISO informs electric utilities and power consumers that there's a problem in the offing. In response, power consumers who have signed up for a utility's DR program act to reduce their nonessential needs — for example, by cutting down on the lighting and cooling in underused parts of their buildings. This helps avoid a grid crisis and benefits consumers through lower energy bills, since the peak power consumed during high-use periods is the most expensive power. In addition, the process of identifying the energy use that can be reduced during grid overload can often also help facility managers improve the overall energy efficiency of their buildings. AutoDR is the technology and communications platform developed by the Demand Response Research Center, which was launched by the California Energy Commission's Public Interest Energy Research (PIER) program at Berkeley Lab in 2003, to support all forms of demand response. Under Piette's direction, the DRRC manages a portfolio of research projects that address pricing, valuation, behavior, building dynamics, and technology development. The CLIR box, a Client Logic Integrated Relay, is an analog-to-digital signal processor developed by the Demand Response Research Center, which allows building systems to receive automated demand-response signals inexpensively. AutoDR links a facility's energy management or other onsite control systems with customer-programmed energy management strategies. With AutoDR, building operators systematically identify and program building-response control strategies in their energy management systems. This approach not only reduces the cost of participation, it also produces more consistent and substantial demand reductions. Here's how it works: customers who are willing to reduce their demand when the power supply is threatened ("reliability events"), or in response to critical pricing, identify in advance how they will reduce, shift, or otherwise control their facility's demand. These strategies are then programmed into the control system and are automatically turned on ("dispatched") in response to standardized internet-provided price, reliability, or activation signals from the host utility. Customers with energy-management systems not capable of directly receiving internet signals can implement a secure, self-configuring internet relay called the Client Logic Integrated Relay, or CLIR box. 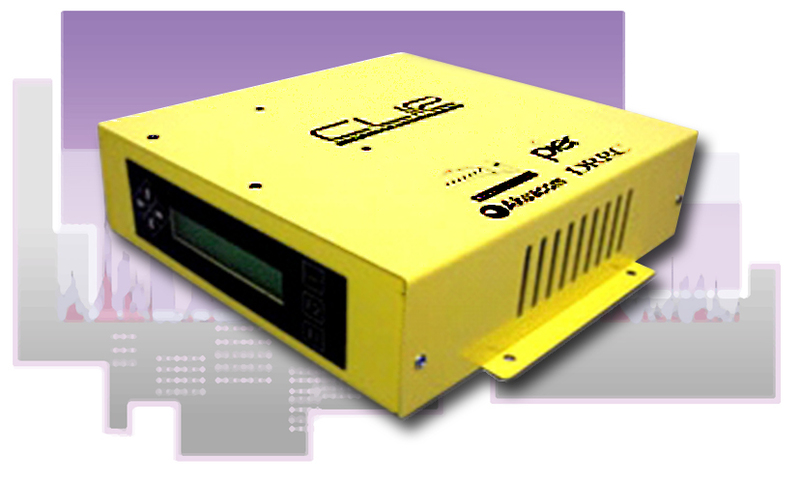 The CLIR is an analog-to-digital signal processor developed by the DRRC that allows building systems to inexpensively receive AutoDR signals. In California, companies signing up to use AutoDR are enrolled in Critical Peak Pricing (CPP) tariffs run by Pacific Gas and Electric Company (PG&E), Southern California Edison (SCE), and San Diego Gas & Electric Company (SDG&E). Customers on a CPP tariff are charged a daily time-of-use rate except when electric-system congestion or emergency events meet a prearranged criterion. When that happens, customers are charged a critical peak price. "California is the first state in the country to offer demand response programs with the enhanced features of open, interoperable, end-to-end automation," says Piette. "AutoDR is helping California's investor-owned utilities overcome information, awareness, and technology barriers that have been limiting the wider use of demand response." During an emergency, cooperation between customers and electric utilities invokes the use of AutoDR. At the utility, an event notification system issues a DR alert. The utility sends a signal to a web server called a Demand Response Automation Server (DRAS), which publishes the event notification and the increased price of power. The DRAS is programmed using industry-standard protocols such as XML and SOA, the secure Web Service Oriented Architecture. Energy management systems, lighting controllers, and other controls with DRAS clients at participating customer facilities continuously listen to the DRAS signals over the internet. Customer energy-management and control systems automatically activate the preprogrammed strategies unless facility managers intervene. Facility managers receive alerts informing them of DR events. 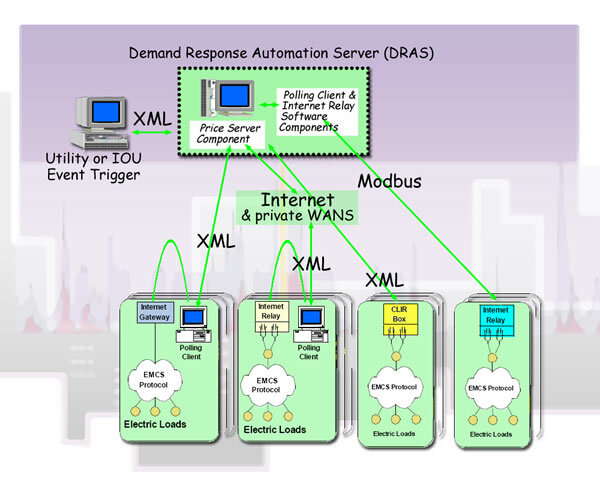 When a utility's event notification system issues a demand-response alert, a signal is sent to a web server called a Demand Response Automation Server (DRAS), which relays the information through a variety of channels to all clients, including fully automated response systems. Usage and pricing information are continually exchanged between clients and DRAS until the event has passed. AutoDR programmed control strategies initiate such measures as dimming or turning off lights, reducing air conditioning in certain zones of the building, resetting thermostats so that the building temperature is allowed to drift a little bit higher, precooling the building, and turning off specific pieces of equipment such as fans and humidifiers. (Precooling is a strategy that uses cool night-time or early morning air to cool the building, in anticipation of high temperatures later in the day; it reduces air-conditioning use during the afternoon peak.) The emergency passes, and electricity prices return to normal. In 2007, 152 commercial and industrial customers participated in AutoDR and reduced their peak load by 25 megawatts (MW), representing about 34 percent of their aggregate peak demand. Just one year before, 13 participating customers had reduced their peak load by one MW, an average of about 11 percent; then a set of orders issued by the state's Public Utilities Commission in late 2006 led to the broad expansion of the program. The road to automated demand response began in 2003 with a research program carried out by Berkeley Lab's EETD and its private sector partners, funded by the California Energy Commission's PIER program. During the first two years, researchers tested the technology, refined the DRAS configuration, and worked to better understand and measure customer response. PG&E offered AutoDR as a part of its Critical Peak Pricing tariff option in 2005. AutoDR's increasingly positive results led the CPUC to order its expansion to all of the state's regulated utilities. In response, PG&E, SCE, and SDG&E developed accelerated plans to incorporate AutoDR into their existing portfolio of DR programs and tariffs. Large commercial and industrial customers throughout each of the three service territories acquired AutoDR capability. Participating facilities included large retailers such as Ikea, Safeway, Target, and Walmart stores, the biotechnology company Gilead, and Oakland's Chabot Science Center, a museum serving a large school-age population. A number of Silicon Valley companies with an obvious interest in the application of information technology also participated, including Echelon, Oracle, Solectron, and Sybase. Government agencies and school districts were also participants. AutoDR has consistently produced average peak period demand reductions of 10 to 14 percent annually over the last five years. A representative AutoDR load-shedding event took place on June 13, 2007, when 17 participating sites reduced their electrical power use — up to 360 kilowatts during the hottest time of the day, noon to 3:00 p.m. This graph shows the 24-hour electrical load aggregated for all 17 customers during a grid event on June 13, 2007. Each colored band represents the amount of power being consumed by one facility. 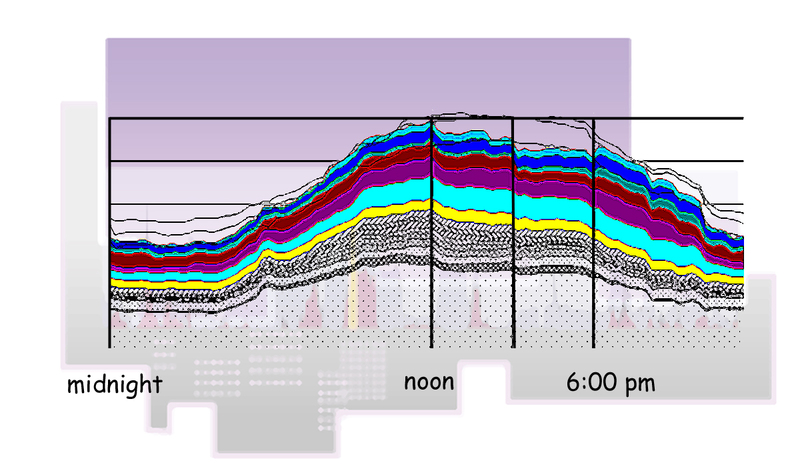 A downward dip in total power consumption is visible between noon and 6 pm, a reduction attributed to automated demand-response. Productivity for AutoDR-supported facilities has increased substantially over the last two years. The average commercial facility's peak-period reduction improved from 13 percent in 2006 to almost 21 percent in 2007. A team of experts including scientists from Berkeley Lab worked with the utilities and their customers to ensure that customers would establish realistic, repeatable automation strategies. Most participants evaluated their participation positively. The success of AutoDR has led utilities to plan further expansion. PG&E is planning to expand AutoDR technology to customers in its Capacity Bidding Program; PG&E's goal is an additional 8 MW reduction in 2008, for a total of 30 MW in AutoDR reduction. Southern California Edison plans to add AutoDR to its Demand Bidding Program in 2008, with a reduction goal of 10 MW. "AutoDR is an innovative and ground-breaking effort that is aimed at making price-responsive programs far more effective than they have been in the past," says Piette. "The successes of this effort will serve as a model for wider-scale AutoDR program implementation throughout the United States and abroad in the years to come."